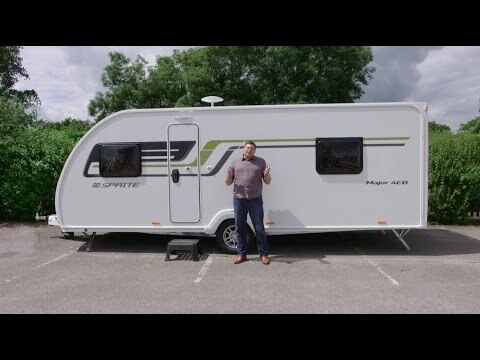 Sprite’s line-up for 2017 sheds the nearside-fixed-bed Major 4 FB, and adds two new models: the twin-axle, six-berth Quattro DD with twin dinettes and amidships kitchen and washroom; and the single-axle, four-berth Major 4 EB, offering a mid-transverse washroom with a rear island bed. All 2017-season Swift caravans are of SMART Plus construction, using timberless GRP bodyshells with controls operated by the Swift Command unit. All have Thule bike rack fixings, too. And to see other Sprite caravans for sale, click here. The 2017 Sprite Major 4 EB’s curved front sports a three-piece window and a wide gas locker. The body rides on an Al-Ko chassis and, like all Sprites, our model came with the £495 Diamond Pack upgrade, bringing an Al-Ko stabiliser, wheel-lock receiver and alloy wheels, but no ATC. You can stand on the hitch to reach the optional panoramic window for easy washing. Bolts for raising and lowering the standard-sized steadies are easily reached. Linear graphics pass from the front nearside window over the unglazed entrance door to the rear nearside window. The single-piece entrance door has a chunky, solid-feeling chromed handle on the outside and a lever-style handle inside. We also like the magnetic door stay. The door has a slim pocket on the inside rather than a bin. Aside from the awning light above the door, nothing else marks the nearside’s exterior: all services are on the offside. Rear lights cluster in a leaf shape on the moulded back panel. Inside, just above the entrance door, are the Swift Command, Truma heating and Tracker controls (an annual subscription for the latter is £95). Adjacent on the locker sidewalls are the smoke and carbon dioxide alarms. Beside the door is a dresser, opening towards the lounge rather than the kitchen. This makes the lower cupboard usefully wide rather than deep. The upper cupboard is shelved. On the lower cupboard are switches for the awning and mains lights, and above it you’ll find the aerial, 12V and mains points, with room on the dresser’s surface for a TV. The interior scheme is medium-toned cabinetwork with oatmeal-grey tweed furnishings, given a lift with lemony-lime and charcoal grey scatter cushions (part of the Diamond Pack) and ’50s-inspired curtains with lime, grey and black leaf motifs on an off-white background. It’s fun, pleasing and not too controversial, but you can also opt for the French Grey and gold ‘Albion’ soft furnishings for £195. The seat backs are plump and straight, and the base cushions are thick and comfortable. Squidgy bolsters at the front invite you to put your feet up and there’s plenty of length. The bolsters have two faces – one in charcoal, one in lemon – so you can contrast them with your scatter cushions. Seat bases have convenient front-flap access. The base on the offside has the mechanical organs that make this caravan a home from home, but the consumer unit has been placed centrally, so there’s little space for anything else. The nearside base is free to fill. One vent channels warm air into the area. The two-drawer centre chest has a pull-out granite-effect occasional table. Behind that is a moulded console on a narrow shelf, with a plug socket on either side of a recess that would be ideal for mobile phones. It’s a shame there are no USB points. Set in the frame surrounding the sunroof is a main light, and on either side are the speakers – their position brings them more or less into the middle of the lounge space for optimum sound spread. The single roof lockers on either side are wide, and you access the corner roof space through them, so they are not shelved. It is a little awkward. The offside locker has a radio/CD/MP3 player (part of the Diamond Pack). A Heki rooflight, in addition to the windows and optional sunroof, keeps things bright by day, and at night you can choose your level of illumination with four spotlights, over-locker LED lighting and the main light. Off-white overhead cabinets with chrome handles define the Sprite Major 4 EB's kitchen area. It’s well equipped, with a small Dometic three-way fridge-freezer, a Thetford cooker with three-burner gas hob and a separate oven and grill. Our caravan had the Diamond Pack microwave set in dedicated housing high between the two wall cupboards above the sink. One cupboard has racking for crockery, the other isn’t shelved. Between fridge and cooker are a cutlery drawer and cupboard; the small wire vegetable rack would be more useful if it pulled out. Gas controls are in here and there’s space for the detachable drainer. Under the oven is a pan locker. The granite-effect round sink is quite a good size and served by a chromed mixer tap. The sink and hob are positioned next to each other, leaving worktop space to the left. There’s room for a kettle and a chopping board, but for more prep space, a good-sized extension flap flips up over the offside sofa. You have just one socket for appliances and a light switch to operate the two LED downlighters above the wall cupboards. A small window and roof Heki perform daytime lighting and ventilation duties. The washroom cuts across the caravan’s centre, dividing it into rooms. A door connects it with the lounge, and two sliding doors lead to the bedroom. From the lounge you face a central vanity unit, comprising an oval plastic basin in a narrow worktop with a chrome-style mixer tap. Beneath the basin is a shelved cupboard. On the offside, the electric-flush swivel toilet sits next to the wheelarch, which has been boxed in to make a surface for cleaning materials or toilet rolls. Behind the toilet is a large frosted window; above that is a two-door cupboard with no shelving, but there are a couple of small shelves to the right. From this side, access to the bedroom is a little tight. On the nearside the fully lined, semi-circular shower unit has been moulded around the intruding wheelarch. It’s the only place to put shower gel or soap; if you drop it, you’ll need to open the door to retrieve it. There are two towel hooks and one towel ring, plus a small shelf here. Access from this side to the bedroom is much better. One blown-air heating outlet warms the space, while four small LED lights, the frosted window and one small rooflight illuminate it. Sliding doors on either side of the Sprite Major 4 EB's central basin lead from the washroom to the bedroom. The central island bed looks a good width, its Duvalay Duvalite mattress is comfortable, and it measures a useful 6ft 3in long. There’s a lightly padded headboard in grey tweed. Overhead are two large wooden lockers with chrome handles, and on either side is a wardrobe with a drawer and a shelved cupboard below. The wardrobes are the same size, with good hanging area, although the nearside one has given up a little space for the freestanding lounge table. LED strips above the lockers provide an ambient glow, and two spotlights give reading light. Daylight enters via a rooflight and a window on either side. On the back of the washroom wall is a bracket for a TV with aerial, 12V and mains sockets, plus a light switch. Above are two small LED lights. The bed base has a plug socket on one side and a heating vent on the other. It’s a comfortable, practical arrangement, with easy access through the washroom to both sides of the bed. However, if you don’t close the sliding doors you have a view from the bed of the loo or the shower. The big lounge bed is made by pulling out slats from the centre chest and rearranging cushions. In this couples’ van, storage is adequate, not generous. Bulky items such as loungers or picnic chairs can be stowed under the island bed, but they have to share with the spare wheel. There’s also that clutter-free area under the nearside sofa, but no exterior access to either. There’s hanging space aplenty, but only two lockers for folded clothes and two at the front for other paraphernalia, although there is the bottom half of that dresser inside the door. The kitchen has just two overhead cupboards, a slender cutlery drawer and a narrow cupboard below; we reckon you’ll need the dresser opposite for provisions. Cupboards take care of toiletries in the washroom, but spare towels may have to go in the bottom of the wardrobe. The Sprite Major 4 EB provides a great centre washroom/island bed layout within a standard-sized caravan body, at a sensible price and weight. The interior is smart, the kitchen perfectly adequate and the bedroom luxurious, with its TV set-up. If buyers always specify the Diamond Pack, why isn’t it standard, especially now that Swift Group has introduced the more basic Sprite Freedom? Another mains socket in the kitchen would be useful, as would USB points.